Detroit, it seems, has finally caught up with the realization that urban planning can be quickly and radically altered thanks to the myriad advantages of a two-wheeled transportation system. Unfortunately, GM has backed the wrong horse and has displayed the cutting-edge decision-making processes that lead to the Hummer as a commercially available vehicle. 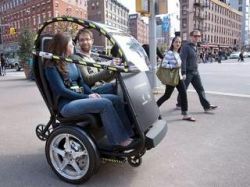 The new Segway-partnered transporter called the P.U.M.A, which is short for Please Underwrite My Autos, Personal Urban Mobility and Accessibility (and is an acronym that’s not even grammatically correct) and seats two, incredibly environmentally sensitive people. Not as environmentally sensitive as if they had walked or ridden their bikes the model shown to the press seems to lack any sort of onboard storage for things like groceries, office supplies, shopping bags or any of the things you might want a vehicle for. Certainly revamping a city to fit a culture based around these Jetson-shaped vehicles would make it more efficient than basing it around larger autos, but maybe GM could have taken their considerable research and development prowess, gained while developing the soon-to-be-doomed Volt and put it into things like electric-assist bikes. In any case, this is almost a moot point as the PUMA won’t hit the streets without some sort of infrastructure in place, as we’re guessing that most municipalities here in the States won’t let devices less protected from crashes than your average golf-cart ride in the vehicular lanes, and the existing bike/ped facilities aren’t sophisticated enough to support bikes and pedestrians efficiently, let alone Blade Runner style scooters. Still, it’s good to know that GM’s not going to waste any of the billions of taxpayer dollars it’s likely to get on things as frivolous as improving the efficiency of the internal combustion engine or making an electric-powered car that’s viable in today’s market.